An impressive cast is being assembled for Tangle, the new locally-produced drama being made by Showtime. Justine Clarke, Ben Mendelsohn, Catherine McClements, Matt Day, Kat Stewart and Joel Tobeck have all signed on. The series will be shot in and around Melbourne from September and screen in 2009. An outstanding Australian cast has been secured for TANGLE the new 10 x 1 hour premium original series from the makers of Love My Way. A gritty drama, TANGLE is being produced by John Edwards and Imogen Banks. Executive Producers will be Hugh Marks for Southern Star, and Kim Vecera for SHOWTIME Australia. Dealing with the tangled lives of parents, their teenagers, and the shifting moral compass of modern life, TANGLE will be shot in and around Melbourne, Victoria from September this year. The show will premiere on showcase in 2009. Written by Fiona Seres (Love My Way, Dangerous, The Surgeon) and Tony McNamara (Love My Way, The Secret Life of Us) and to be directed by Jessica Hobbs (Love My Way, Curtin, Answered by Fire), Matthew Saville (The King, Noise, The Surgeon) and Stuart McDonald (The Secret Life of Us, Summer Heights High, SeaChange) TANGLE is being produced with the assistance of Film Victoria and investment by AUSTAR. is anybody at all able to help me with the main locations in Tangle. Never mind…just found the answer to my own question. Helps when you Google it yourself. Check out the link below about the next series. 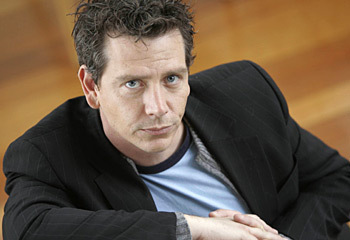 Unfortunately, it’s not certain whether Ben Mendelsohn will return due to the way the last season finished. Bring it on! Can’t wait for the next series. I thoroughly enjoyed this series too. It covered storylines that parents and teenagers could relate to. A good series to watch together to invoke conversation about the perils of being a teenager and an adult! Bring on the next series! Anyone know if it’s in production yet? Just watched the final episode of season one and it was nothing short of brilliant. Vince had some absolute unforgettable lines and whilst may deemed as crude, lewd and rude they still had myself and my 16 year old son laughing. His rather vehement racial slings were more than well said and in these times of asylum seekers and people smugglers even justified. He played a character that said it as he saw it. Well scripted for and acted by Ben. Had a bit of trouble getting my head around Gigi and Max’s character. The former was not portrayed believable in that she was way too wise for her age and the latter was forgettable and unenthralling. Christine needed to get over herself and Nat shouldn’t have a pommy accent. Didn’t suit. Justine Clarke was brilliant and played her role exceptionally well. Thoroughly enjoyed the storyline and it was by far the best thing on Austar on a Thursday night. Well done to all involved. Matt Day is hot, hot, hot in this series. As for Justine Clarke, not short of outstanding. Love, love, love this show and look forward to it every week. Ben Mendelsohn is absolutely fantastic, as is Justine. Multi-talented, for sure. I am no movie critic but I saw Tangle and I was shocked to think that alot of script writers came out with that Rubbish. The two stories running along seemed to definately jump too far in spots and Ben Mendelsons **spoiler**. Ben didn’t suit the part at the workplace, swearing etc, at the chinese man, that had racial connotations, Ben is a brilliant actor but this was not one of his best. It didn’t do Ben justice, the on again, off again love scenes were so on cue, they didn’t seem natural and flowing. The tangled lives of Adults and their dysfunction is more than real in most homes throughout Australia without the need to screen it on TV and then to include **school children** This is disturbing! What have our children got to look up to… a whole lot of adults in the sack with everyone elses wife or husband and then their disturbed children**spoiler**!!???? Go back to the drawing boards guys. I was an extra in this production also (my 2nd proper gig!) and am waiting enthusiastically for it to start. Thanks to all production staff – it was great fun! twenty years now, and have now found this form of “Connection” to one other Mahady, of whom I seemingly had no previous knowledge, and whom I would love to find out more about, apart from my watching “Tangle”, when it starts up. Consequently, I would appreciate any further information/details regarding the above, or perhaps even someone to contact me, or the means for me to contact them, in order that I may find out more about this Pat Mahady and his Family etc. Matt Mahady – A Scottish, Irish, Australian. Tangle is still a few months off, but check via Search for earlier articles on the show. I have seen the pilot and it is excellent. Series seems to have strong potential. Brilliant cast, beautifully written and shot. Yeah, I thought that I was maybe getting my hopes up a bit! But it was on a Chromamedia website. I’ve read a couple of times now that Tangle is also going to be on Channel Ten as well. I hope it is, coz not everyone has foxtel! Read where? Sounds unlikely unless it is a year or more later. hey im the horse that sings in the play and im also a school girl extra who laughs at gigi in her chciken costume look out for me!!!! Actual dates would be great.